The unraveling of US/Russian relations threatens life on earth. These are the consequences of Washington threatening Russia’s security by breaking agreement after agreement, by placing missile bases on Russia’s borders, by orchestrating anti-Russian coups in former Soviet provinces, and by a continuing volley of false accusations against Russia. Yes, and finally Robert Mueller(See Note 1, below), the special counsel in the Trump-Russia investigation – which perhaps should be the Clinton-Russia investigation. There is no act more reckless and irresponsible than to make one nuclear power fear nuclear attack from another. Gorbachev’s warning could be an understatement. Last March, General Viktor Poznikhir, the deputy commander of the Russian military’s Operation Command expressed concern that Washington could be preparing a surprise nuclear attack on Russia. Had any such statement from the Russian high command been issued anytime during the 20th century Cold War era, the President of the United States would have immediately contacted the Soviet leader and given every assurance that no such plan or intentions toward Russia existed. As far as I can tell, the Trump White House let this ominous announcement pass unremarked. If this is the case, it must have provided confirmation to the Russians’ conclusion. The entirety of the West, both the US and its vassal states, continue to ignore very clear Russian warnings. Gilbert Doctorow has made the same point. Perhaps the clearest of all was Putin’s public statement that “Russia will never again fight a war on its own territory.” If Washington’s EU vassals did not hear this clear warning that they are courting their nuclear destruction—especially the Poles and Romanians who have mindlessly hosted US missile bases—they are as deaf as they are stupid. So why do Washington’s impotent vassals talk tough to Russia, a government that only desires peace and has threatened Britain in no way. Nor has the Russian government threatened France, Germany, Italy, Belgium, Greece, Spain, Portugal, the Netherlands, Sweden, Norway, Denmark, Finland, or any of the former Eastern European vassals of the Soviet Union that exchanged their captivity to the Soviet Union for captivity to Washington. Russia has not even threatened Ukraine, which Russia could wipe out in a couple of minutes. Why are these countries, apparently led by mindless, gutless two-bit politicians, aligned with Washington’s false propaganda against Russia? The answer is money—it’s always about the money—always is. The vassals are paid to go along with the lies. What are the forces driving Washington’s provocation of Russia? There are two forces driving Washington’s provocation or Russia and they comprise a vast conspiracy against life on earth. American exceptionalism is a myth, despite its praise by Obama. American exceptionalism allows the bombing of other countries indiscriminately without officially being at war with those countries. American exceptionalism allows the separation of powers prescribed in the American Constitution can be totally ignored by the executive branch as, the Neoconservatives claim, the President has “unique powers” not limited by the Constitution, which, of course, is a lie. The second interest with incentive to provoke Russia is the US military/security complex. President Eisenhower, a five-star general, warned Americans in 1961 that the “military-industrial complex” was a threat to American democracy. Today the military/security complex is much more than a mere threat to American democracy. It has already taken over the US government and the Trump administration, which is run by generals, and it now threatens all life on earth. The military/security complex has an annual budget of one thousand billion dollars. This sum is larger than the Gross Domestic Products of all but a handful of countries on earth. Such an immense budget conveying such power desperately needs a dangerous enemy for its justification. Russia has been assigned this role. Given the power of the military/security complex, the role assigned to Russia cannot be mitigated by Russian diplomacy. Moreover, the interests of the military/security complex and the Neoconservatives agree. 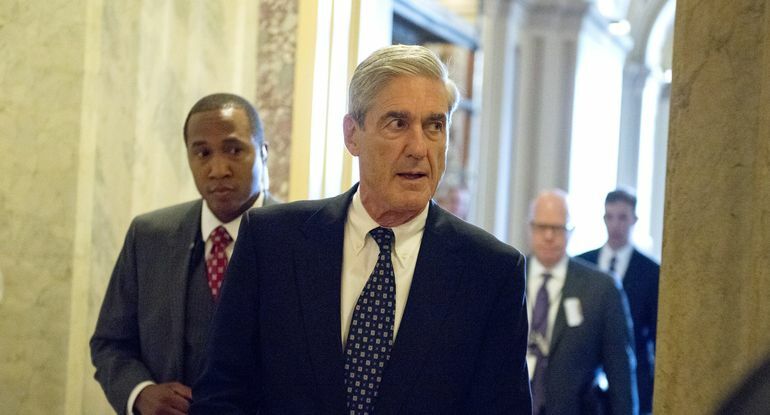 Robert Mueller who may have been responsible himself for allowing tremendous Russian corruption on U.S. soil to continue—and even intensify—during the Obama administration is now leading the investigation into potential Russian connections involving the man who ran for president against Obama’s legacy. Conflict of interest, much? In 2015, conservative author Peter Schweitzer published a blistering story in The New York Times uncovering Clinton’s connections to and benefits from the 2010 Uranium One purchase. The Obama administration and the Clintons defended their authorization of that purchase by insisting that there was no evidence any Russians or donors to the Clinton Foundation engaged in wrongdoing. They also argued that there was no national security reason to oppose the Uranium One deal. According to documents from the FBI, Energy Department, and court proceedings, however, the FBI had gathered substantial evidence before the committee’s decision that Vadim Mikerin — the Russian overseer of Putin’s U.S. nuclear expansion — was engaged in wrongdoing since 2009. Mikerin directed Rosatom’s Tenex in Moscow since the early 2000s, and he oversaw Rosatom’s nuclear collaboration with the U.S. under the Megatons to Megawatts program. In 2010, he acquired a U.S. work visa to open Rosatom’s new American arm, Tenam. According to a November 2014 indictment, Mikerin “did knowingly and willfully combine, conspire, confederate and agree with other persons … to obstruct, delay and affect commerce and the movement of an article and commodity (enriched uranium) in commerce by extortion” between 2009 and 2012. His conduct was discovered with the help of a confidential witness who began making kickback payments at Mikerin’s direction, with the permission of the FBI. The first recorded kickback payment was dated November 27, 2009. The investigation was supervised by then-U.S. attorney (and currently President Trump’s deputy attorney general) Rod Rosenstein, then-assistant FBI director (and now deputy FBI director) Andrew McCabe, and then-FBI director Robert Mueller. All three of these men play key roles in the Trump-Russia investigation. The FBI investigation, kept secret from the American public just when the Obama administration made key international business decisions, also exposed a serious national security breach: Mikerin signed a contract giving American trucking firm Transport Logistics International the rights to transport Russia’s uranium around the U.S. — in return for more than $2 million in kickbacks from executives. Uncovering and blocking such a massive Russian nuclear bribery scheme would seem like a pivotal success for the DOJ and FBI, but they took little credit for the investigation when Mikerin, the Russian financier, and the trucking firm executives were arrested in 2014. A full year later, the DOJ put out a press release unveiling the defendants’ plea deals. At that time, the case against Mikerin consisted of a single charge of money laundering for a scheme from 2004 to 2014. Although agents had evidence of criminal wrongdoing since 2009, federal prosecutors only cited a handful of transactions in 2011 and 2012 in the plea agreement. These came well after the Uranium One deal. The final court case also made no mention of the Russian attempts to peddle influence with the Clintons, which the FBI undercover informant witnessed, despite the documents showing millions of dollars sent from Russian nuclear businesses to an American entity connected to the Clinton Foundation. Ronald Hosko, then-assistant FBI director in charge of criminal cases, told The Hill he did not recall being briefed about Mikerin’s case, despite the criminal charges. “I had no idea this case was being conducted,” he said. Former Rep. Mike Rogers (R-Mich.), then-chairman of the House Intelligence Committee, also told The Hill he had not been briefed about the Russian nuclear corruption case. “Not providing information on a corruption scheme before the Russian uranium deal was approved by U.S. regulators … has served to undermine U.S. national security interests by the very people charged with protecting them,” Rogers said. Considering such a scandal, it seems particularly damning that members of the intelligence community have been shamelessly leaking allegations against Donald Trump involving potential Russian connections. Every story in this direction turns out to be a dead end. Most recently, the Russian-backed Facebook ads turned out not only to support Hillary Clinton and Black Lives Matter, but to have a tiny impact on the election as a whole. In fact, Democrat senators like Richard Blumenthal made fools of themselves in a fruitless attempt to pin these ads on the Trump campaign. Meanwhile, evidence continues to mount that the Obama administration wiretapped key leaders in the Trump campaign, most notably Paul Manafort. The real Russia scandal has been a Clinton scandal, from 2010 onward—and now, in a darkly ironic twist of fate, it involves the very former FBI director responsible for investigating that elusive “collusion” between Donald Trump and Vladimir Putin. It seems the Left’s attempts to hide their own corruption by pinning it on Trump may be coming to an end.